Appearance: The body is laterally compressed. The head has two pairs of antennae and distinctive black eyes. The abdomen comprises seven segments with a pair of legs on each and brushes on the underside of the first four segments. On the last pair of legs on the abdomens fourth segment , a large rounded brush furnished plate is situated. Only the first three segments of the posterior have side plates. Monoporeia affinis has a protrusion on the upper side of the posterior. Yellowish to pure white in colour. Depth: From the surface to approx. 80m. 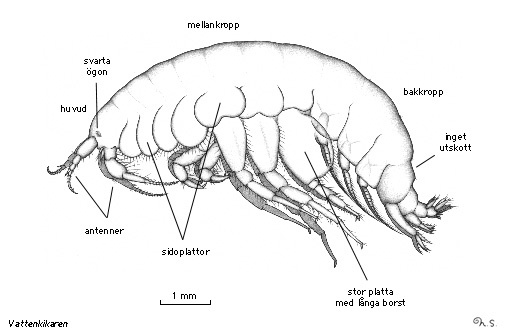 Misc: The closely related species Pontoporeia femorata is found in Scandinavian waters, but not in brackish waters such as the Gulf of Bothnia and surprisingly, it is not found in the northern areas of the Skagerrak. Pontoporeia femorata distinguishes itself in comparison with the Monoporeia affinis by having light red eyes and a splitted protrusion on top of its posterior. It has a light yellow colour and can be up to 9mm long in Swedish waters. Classification: Monoporeia affinis is a member of the amphipod group, which is a crustacean under the arthropods.